Playmobil for Toddlers & Preschoolers? Check out Playmobil 1.2.3! Okay guys, favourite toy time. What is one toy that you would absolutely recommend for preschoolers? 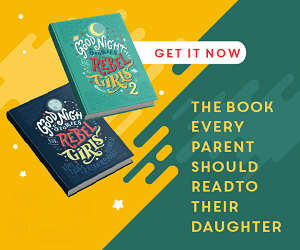 One your kids love (or loved). One that you felt good about them playing with. One that you would buy as a gift for children in the 18-month to 4 years old range? For me, the answer is Playmobile 1.2.3. Playmobil 1.2.3 is the junior Playmobil line. The pieces are slightly chunkier than the regular Playmobil, making them easier for a preschooler to manipulate, and also, of course, eliminating any worries over choking hazards. They basically took everything that is awesome about Playmobil and made it larger and safer for younger kids. The 1.2.3 figures are a little chunkier, a little shorter, and their arms don’t move. The figures still bend at the waist and can alternate between sitting and standing. Other differences include the way these figure’s hands aren’t designed to hold anything and the fact that characters with hats have them firmly attached to their heads. We bought Gracie her first set of Playmobil 1.2.3 from a local educational toy store back in 2008 or so, and at the time I thought it was a brand new addition to the Playmobil line up. Today, prior to writing this up I was trying to do a little research about when the 1.2.3 line launched, and I was shocked to discover it actually first came out in 1990. Just goes to show what you don’t pay attention to until you have kids of your own, right? What’s the right age for Playmobil 1.2.3? When my girls were younger, we had the barn set, a train track set, and the very cool dump truck/sorting house set, as well as several smaller add-ons. These were some of my kids favourite toys. Playmobil, in general, has always been a favourite in this household, and Playmobile 1.2.3 allows kids to step into the Playmobil world of let’s pretend a few years earlier. 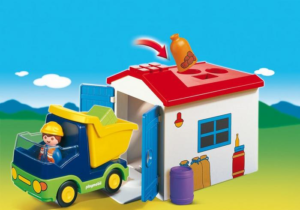 A dumptruck and a garage that doubles as a shape sorter — this was one of my daughter’s favourite toys when she was two and three. The guideline on the box says ages 1.5+. I would say from 18months to age 5 would be a good estimate. My kids were still playing with their Playmobil 1.2.3 when they were five and even six years old. The pieces got mixed in with the “real” Playmobil they received as they got older. It was only last spring that I finally searched through our Playmobil bin, sorted all the 1.2.3 pieces out, and put them together to sell at the local Mom to Mom sale. How does it stand up to toddler & preschooler play? 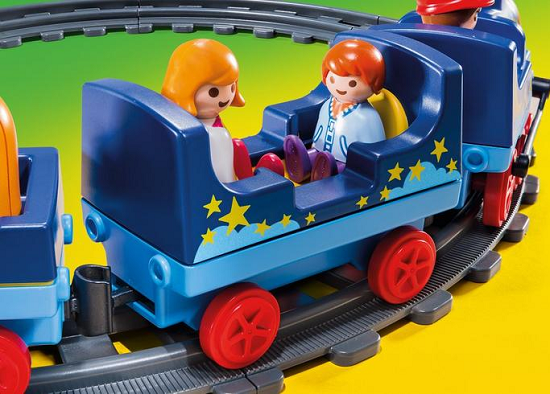 Check out one of the newest Playmobil 1.2.3 sets: the Night Train with Track. 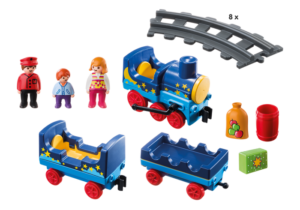 The Night Train comes with three characters; a conductor, a female adult and a child. The conductor has a cute red cap permanently fixed atop his head, the woman is in a flowered jumper, and the child is dressed in such as way that it could be either gender. The set includes eight pieces of track, which snap together to form a big circle for the night train to travel around. The train itself consists of three pieces, an engine, a passenger car and a baggage car. The three train pieces link together to form a long train, or each piece can travel solo, as it’s wheels spin round and along the track (or along the floor). The set also includes a bag of apples, a barrel and a very magical looking piece of luggage to fill the baggage cart up with. The bag of apples looks similar to bags we had with our farm set, so I am sure that other sack or crate type pieces could easily swap in to fill the baggage cart. 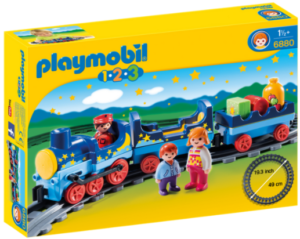 The train pieces are covered in an adorable moon, stars and clouds pattern, which begs the question what exactly is the night train? Perhaps it’s the train that children board to head off to dreamland? The set retails for $34.99. While my own girls have moved on to “big kid” Playmobil, this set still totally tops the list of things-I- would-buy-a-toddler-for-their-birthday. Want to win a Night Train set of your own? Disclosure: The prize for this giveaway is being provided by Playmobil, who has been generous enough to send me various sets over the past year.